It’s cold! It’s snowing! It’s all very exciting! But before you start shaping your snowballs and digging your mittens out of that cupboard under the stairs, take a moment to consider your dog. Yes, your pooch. If you’re cold, they’re cold too, and it’s vital to take some extra steps to make sure they’re happy and healthy when it’s snowing. Don’t stress if you’re a cat person – we’ve published a guide to taking care of them in the cold and snow as well. For any puppies and dogs you’re hanging out with this winter, just make sure to follow these steps, as recommended by Battersea Dogs and Cats Home. Wrap up warm You can’t just stop going for walks, but just like you, your dog needs a coat. 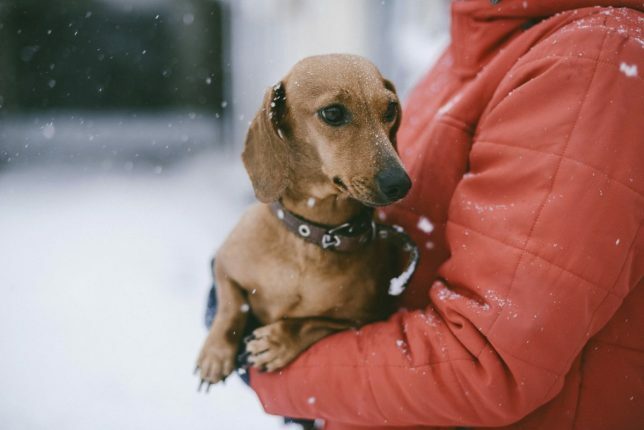 Grab a waterproof coat just for your dog to make sure they’re not shivering when they’re outside. This is especially important if your dog is elderly or has a short coat, like greyhounds and staffies. Check your dog’s paws All that salt and grit on the roads could get stuck in your dogs paws, causing irritation and pain. Plus, snow can compact between dogs’ toes, turning into tiny ice balls which can be incredibly painful. To prevent any issues, have a proper check of your dog’s paws when they return inside, and give them a good dry with a towel. Make sure they have a warm and cosy bed Give your dog their own spot to run to when they come in from the cold – think a cosy bed with their very own pillow and blanket, away from any draughts. Do some indoor exercise You may need to shorten your usual daily walk to make sure your dog doesn’t get too cold or tired (and save yourself, too). Make sure they remain active with plenty of toys and puzzles indoors to prevent boredom. It’s important to maintain activity levels or adjust the amount of food your dog is given to avoid weight gain. Stay away from rivers and lakes Your usual route may go around the pond in the park, but when it’s freezing, you’ll need to mix things up. An iced over body of water is far too tempting for most dogs, who’ll race to slide around. The issue there is that you don’t know how stable that ice may be. It could shatter, leaving your dog absolutely frozen. Never leave your dog in a car unattended You know the drill for hot weather, but the same rule applies in winter. A car’s interior can get mighty chilly. 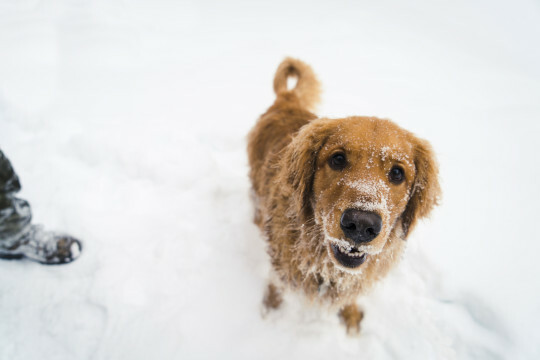 Know the signs of frostbite in dogs A dog can’t tell you when they’re feeling uncomfortable, so it’s vital to know what signs to look for. Signs of frostbite in dogs include very pale skin with a blue tint, skin that feels very cold or brittle to touch, blisters, and sore, red areas. If you notice any symptoms, don’t blast your dog with a hair dryer or stick them next to a radiator. Instead, warm a towel in your clothes dryer or on a radiator, then gently apply the towel to the affected areas. If areas go darker, head straight to the vet. Giving your dog special boots can help to prevent frostbite in the paws.